This juvenile bald eagle flew alongside the RiverQuest during our recent afternoon cruise. Photo by Michael Pressman. ESSEX — Oh, what a trip! 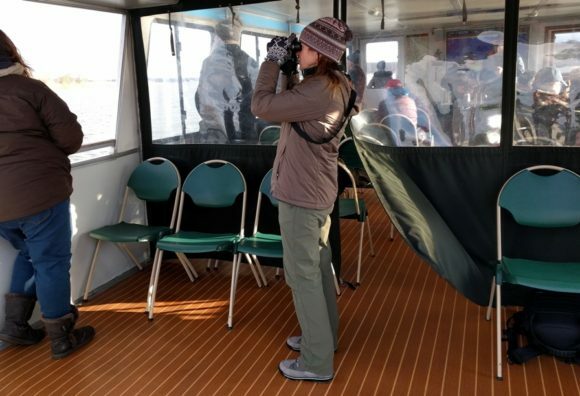 RiverQuest hosted several members of the Fourth Estate recently on a wonderful Winter Wildlife Eagle Cruise. 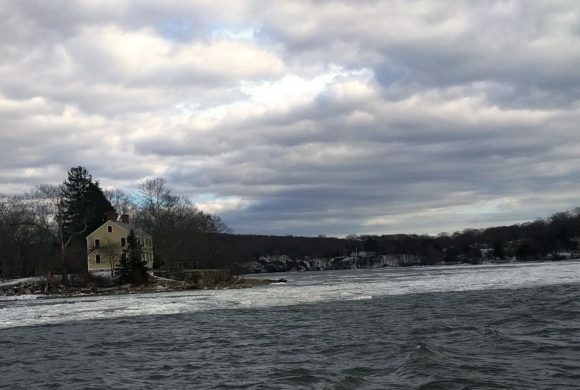 Temperatures were distinctly chilly last Wednesday afternoon (Feb. 13), but the heated cabin stayed warm while the boat gently sailed upstream from the Connecticut River Museum. View from on board the RiverQuest. The views were stunning throughout the trip and, despite the frigid temperatures, the majority of the 30 or so on board stayed outside most of the time to enjoy the whole experience to the full. Look hard and you’ll see the mast (slightly right of center) of the sunken luxury yacht in Hamburg Cove. 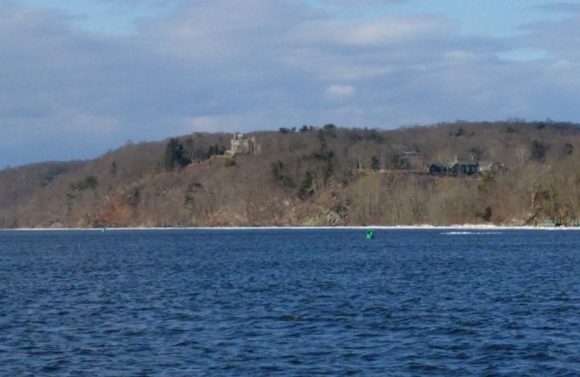 As we sailed north, apart from all the wildlife on the water and in the sky, we saw the mast of the luxury yacht that has sunk in Hamburg Cove and the always delightful view of Gillette Castle high atop its East Haddam perch overlooking the Connecticut River. Gillette Castle commands a stunning of the river. 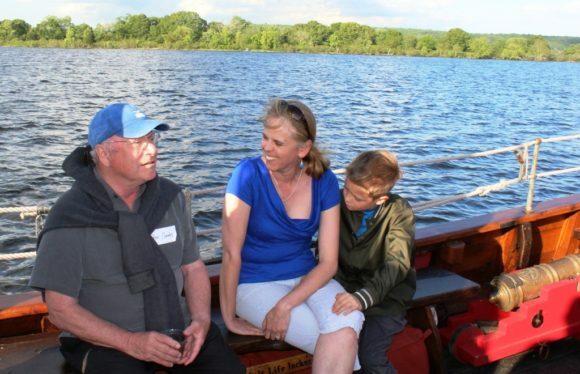 Naturalist and lecturer Bill Yule shared a vast amount of fascinating facts, figures, history, happenings, and anecdotes about the river and its inhabitants, ably accompanied by naturalist and crew member Cathy Malin. 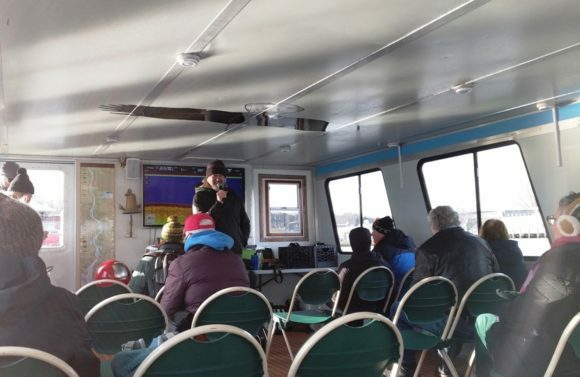 Naturalist Bill Yule shared a great deal of interesting information with the passengers. Both were on board for the duration of the trip and, while not busy disseminating information in a lively and engaging manner, they were actively spotting and identifying wildlife of all shapes and sizes on, above and alongside the river and its banks. They also took great care to ensure the passengers were at all times warm, comfortable … and supplied with plenty of hot coffee! 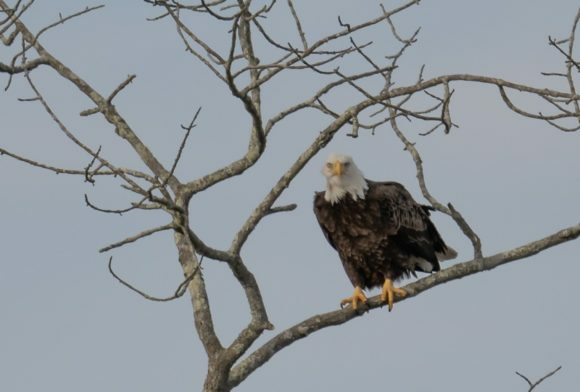 Cathy Malin kept her eyes on the prize and was rewarded with sightings of 13 bald eagles on this trip.. 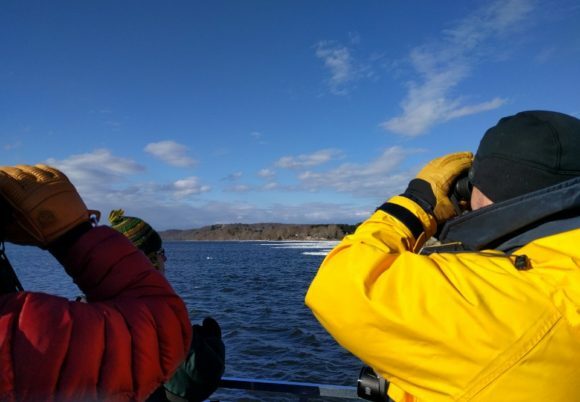 Although named an ‘Eagle Cruise,’ the sighting of an eagle cannot, of course, be guaranteed, but we were fortunate to see 13 bald eagles on our trip, one flying immediately alongside the RiverQuest, and also enjoyed numerous sightings of cormorants, black-backed gulls, and common merganser ducks. An adult bald eagle spotted during our cruise keeps a close watch on everything happening on the river beneath him. Photo by Michael Pressman. The bald-headed eagle — the national emblem of the United States of America — reaches maturity at around age four when it acquires its signature white head and maximum wingspan of approximately six feet. All eyes — and binoculars– were on the sky … and water. Declared an endangered species in 1973 with the passage of the federal Endangered Species Act, bald eagle populations slowly began to recover following the ban on DDT, and by 2007, populations had recovered to such an extent that the species has now been removed from the endangered species list. 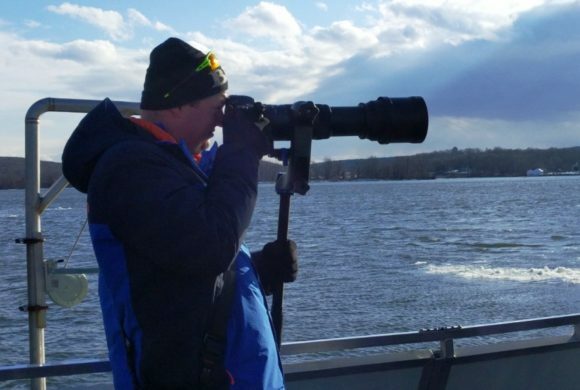 There were a number of professional photographers on board sporting rather larger lenses than our cell phone! The magnificent raptors are, however, still protected on the federal level by the Bald Eagle and Golden Eagle Protection Act of 1940 and the Migratory Bird Treaty Act of 1918. Spotting eagles was the job of everyone on board. 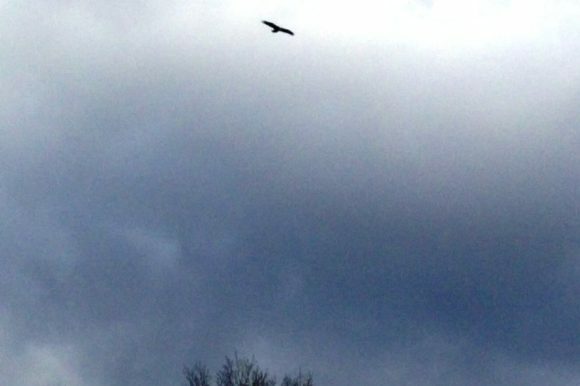 Every winter a number of bald eagles migrate south looking for open water on which to feed as the lakes and rivers in Canada and northern New England freeze. Many of these magnificent birds stop in Connecticut and winter along major rivers and large reservoirs, where they can also be seen feeding and sometimes nesting on the banks of the Connecticut River. A record of all the birds seen during each trip is kept in the Connecticut River Museum. 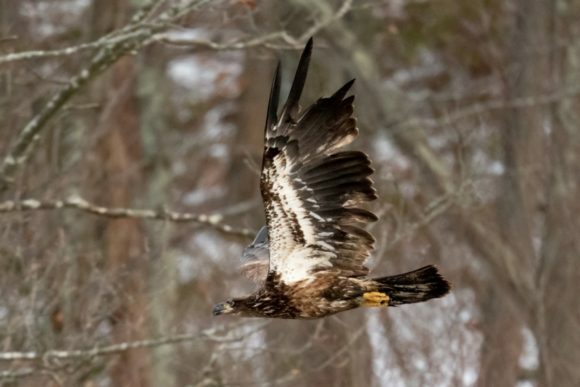 Counts taken in 2018 indicated there were 80 pairs of nesting bald eagles in Connecticut, which produced a record 68 chicks. The Connecticut River Museum was the start and end-point of our trip. 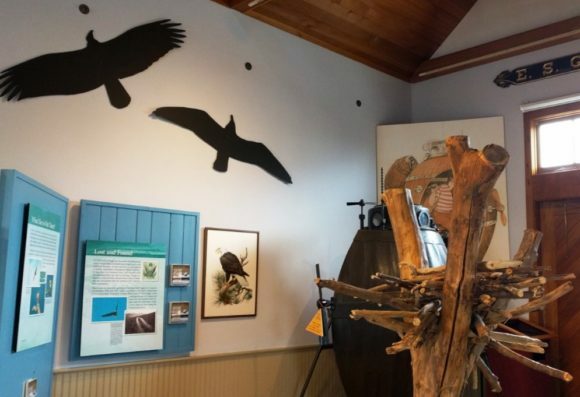 The Connecticut River Museum is currently hosting a “Big Birds of Winter” exhibit, which offers an excellent overview of all the birds that might be seen on the river. This mock-up of an eagle’s nest and the raptor silhouettes are part of the Connecticut River Museum’s “Big Birds of Winter”exhibition. Your $42 ticket not only gives you two hours on the river aboard the RiverQuest, but also admission to all the exhibits at the Museum. 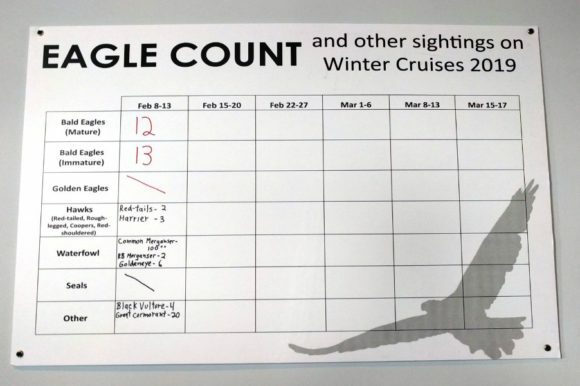 Editor’s Note: For more information on Winter Wildlife Eagle Cruises, visit this link. For more information on RiverQuest and all the trips they offer, visit this link. 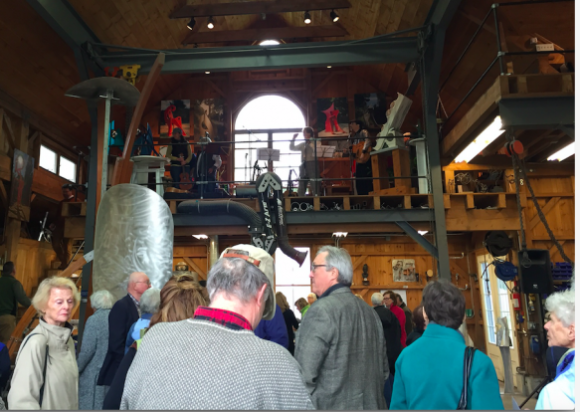 For more information on the Connecticut River Museum, visit this link. 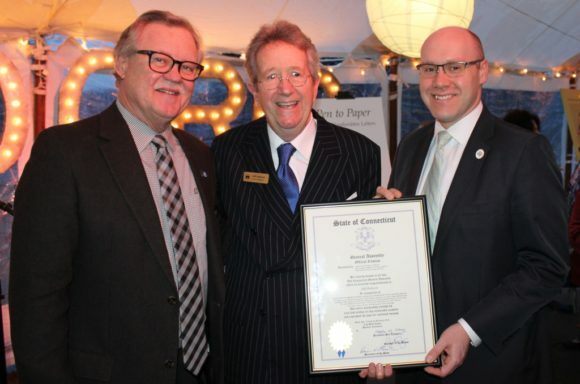 Retiring Florence Griswold Museum Director Jeff Andersen stands between State Senator Paul Formica (left) and State Rep. Devin Carney holding the State Citation with which the two legislators had presented him. OLD LYME — There wasn’t a parking spot to be found Sunday afternoon at the Florence Griswold Museum, nor come to that at the Lyme Art Association. And the reason? 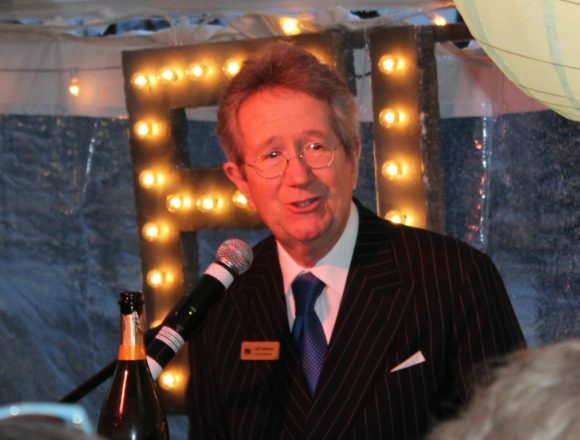 Despite torrential rain, it seemed as if the whole town had come out to say a fond farewell to Jeff Andersen, the much beloved Director of the Florence Griswold Museum, who was retiring after an amazing 41 years in that position. 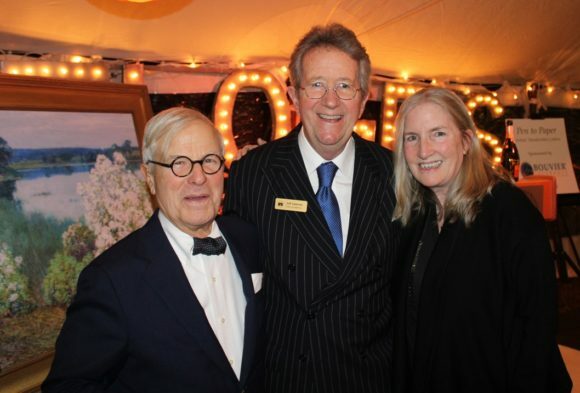 Jeff Anderson stands with Charter Trustee George Willauer and New York Times best-selling author Luanne Rice alongside the Willard Metcalf painting, “Kalmia,” which the board has now dedicated to Andersen in honor of his 41 years service. 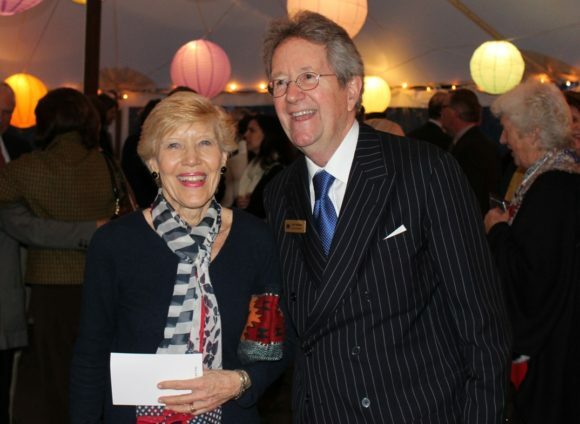 The Museum hosted a wonderful party to celebrate Jeff and his wife, Maureen McCabe, and both Marshfield House and the tent situated in the courtyard outside were packed almost to capacity. 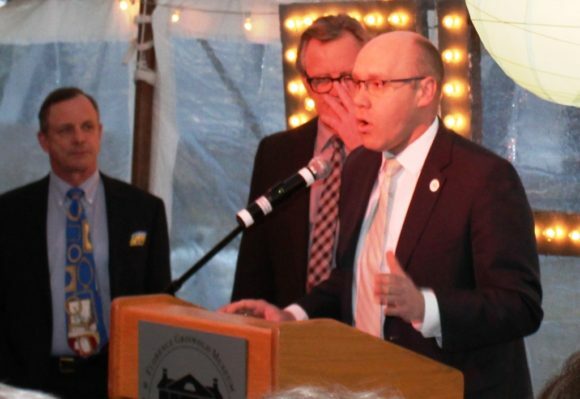 Federal, state and local dignitaries were there along with Museum trustees, staff, volunteers, friends and pretty much anyone who had ever had a connection with Jeff, Maureen or the Museum — well over 400 people in total. State Senator Paul Formica (R-20th) and State Representative Devin Carney (R-23rd) stepped up next the podium and Carney noted poignantly, “It all started with just one … and that was you, Jeff.” Carney was referring to the fact that 41 years ago, Andersen was the Museum’s first — and only – employee whereas now the Museum has 20 staff, 255 volunteers, 3,000 members and 80,000 visitors annually. Saying, “I truly want to thank you, Jeff, for doing so much good for the economy as a whole,” Carney pointed out that many of the visitors to the Museum, “come, stay and shop,” in Old Lyme and the surrounding area, adding, “You did a great job at the Museum … but you also stopped a train!” This latter was a reference to the Federal Railroad Administration’s proposal to route a high speed train through the center of Old Lyme, which Andersen actively worked to defeat. State Sen. Paul Formica reads the Citation from the state in honor of Jeff Andersen. 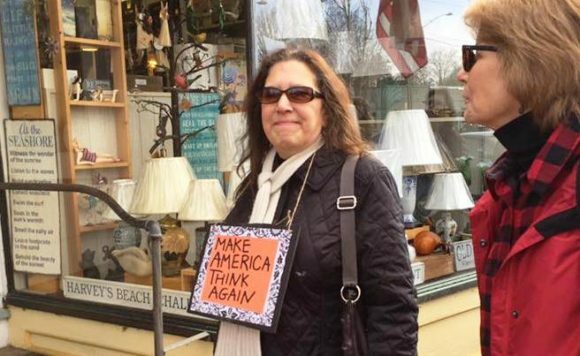 Following the legislators was Old Selectwoman Bonnie Reemsnyder, who immediately confessed, “Frankly, I have to say I didn’t think there would ever be a time when Jeff wouldn’t be here.” She continued, “It’s good for him [Jeff] and all of us to be aware of all you have done. 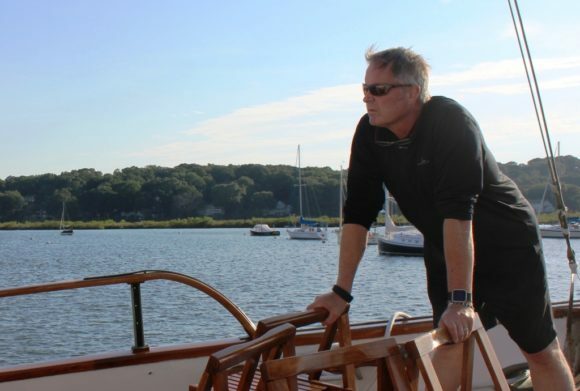 You’re part of our DNA, you’re the heart of our culture,” and then announced that the Town of Old Lyme was declaring Feb. 11 as “Jeff Andersen Day,” adding to loud applause and much laughter that it was a unanimous vote. 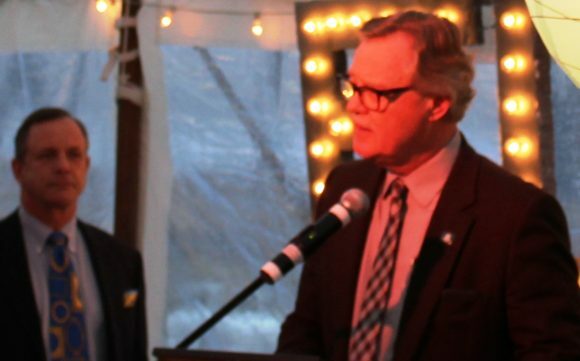 Andersen mingled freely with the more than 400 guests gathered to say their goodbyes. Jeff Cooley (center) emceed thw formal proceedings at the party. His wife Betsy stands to his left. Jeff Andersen addresses the at capacity audience. 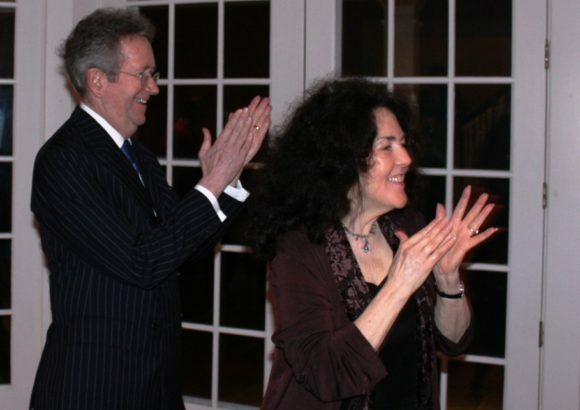 Jeff Andersen and his wife Maureen McCabe applaud the pianist after he played a tune to which they had danced together at the very end of the party. And with that, Cooley proposed a toast to Jeff and Maureen, glasses were raised, Prosecco was drunk and then vigorous applause and loud cheers erupted all around. 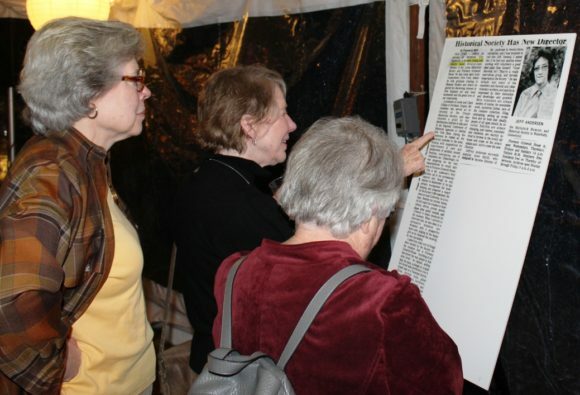 Florence Griswold Museum docent Linda Ahnert points out a detail from the newspaper cutting to fellow doscents. The cutting announced Andersen’s arrival as the Museum’s first director — and then only employee — 41 years ago. AREAWIDE — Perhaps reflecting the mood of the country in Tuesday’s elections, Democrats locally retained control of the majority of seats of government in the Tri-Town area. Needleman’s 737 majority over Pacileo was far higher than the 80-vote margin he achieved over Glowac in 2015, and also in 2011 when, in his first contested election, he defeated Bruce MacMillian by over 400 votes. Needleman was uncontested by town Republicans for a second term in 2013. Glowac had previously served as first selectman from 1991-1995. In Deep River, where all three board of selectmen candidates were unopposed, incumbent Democrat Angus L. McDonald, Jr. won 804 votes to be returned as first selectman. He is joined by fellow Democrat incumbent Duane Gates (D) with 601 votes and newcomer William L. Burdick (R), who polled 360 votes. 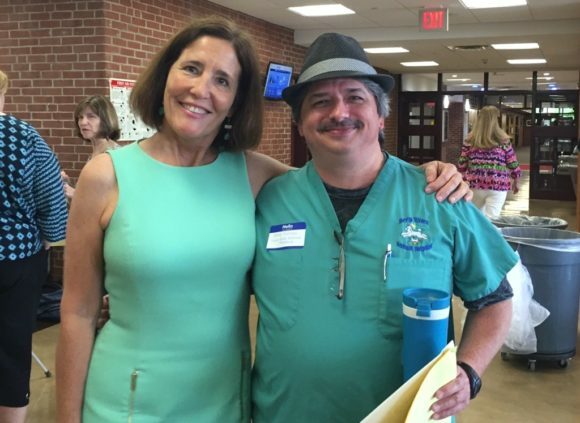 Chester saw another incumbent Democrat Lauren Gister re-elected to the position of first selectwoman with a strong showing of 797 votes, representing a more than 2 to 1 margin over Republican challenger Carolyn Linn (360 votes). Gister’s fellow incumbent Democrat Selectwoman Charlene Janecek, who polled only 32 votes less than Gister, also retains her seat on the board. The third member of the board will be Republican James Grzybowski, who defeated Linn by just three votes. The only Republican success in the area was incumbent Carl Fortuna’s re-election in Old Saybrook with 1,911 votes over Democrat Stephen Sheehan, who polled 1,220 votes. Joining Fortuna on the board will be Republican Scott Giegerich (1,688 votes) and Democrat Carol Conklin with 1,398 votes. View of the Sculpture Grounds at Studio 80 where the Opening Reception for Summer Sculpture Showcase 2017 will be hosted on June 10. Three works by Gilbert Boro can be seen in the photo. Gilbert Boro, owner and sculptor at Studio 80 + Sculpture Grounds in Old Lyme, is hosting an Opening Reception on Saturday, June 10, from 5 to 8 p.m. for two new exhibitions on his property, Summer Sculpture Showcase 2017 and The Golden Hour. All are welcome to attend the reception at which light refreshments will be served. During the Opening Reception, there will be two live, outdoor performances at 6 and 7 p.m. by the GUSTO Dance & River Valley Dance Project. All are welcome to attend the reception, watch the dance performances and wander the beautiful gardens and on-site gallery to view the works. GUSTO Dance & River Valley Dance Project will present two live performances on Saturday, June 10, at Studio 80 + Sculpture Grounds. Summer Sculpture Showcase 2017 follows on naturally from last year’s extremely successful juried exhibition of the same name , which drew large crowds and had to be extended into October to meet public demand. This new exhibition on the grounds adjoining Boro’s studio and inside the Emily Seward Boro (ESB) Gallery on the property features works created by 17 widely acclaimed sculptors interspersed among Boro’s own sculptures, along with works by 22 other contributing artists. More than 30 sculptors from across the country responded to the Call for Entries submitting some 60 works. 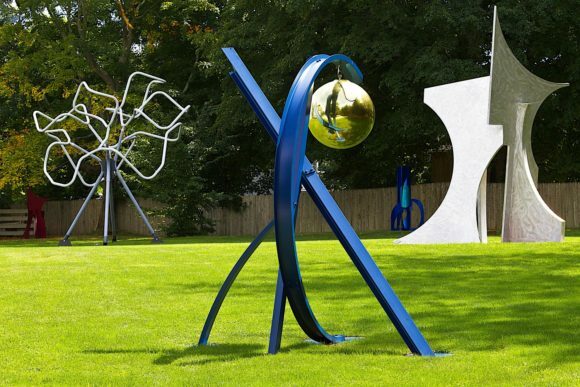 Boro’s expansive Sculpture Gardens are located on 4.5 acres of his residence on historic Lyme Street in the heart of Old Lyme, Conn. The beautifully landscaped grounds slope down toward the Lieutenant River offering a unique en plein air experience for the exhibition, which combines both large- and small-scale contemporary sculptures. Many of the works, which are in a variety of media, are for sale. 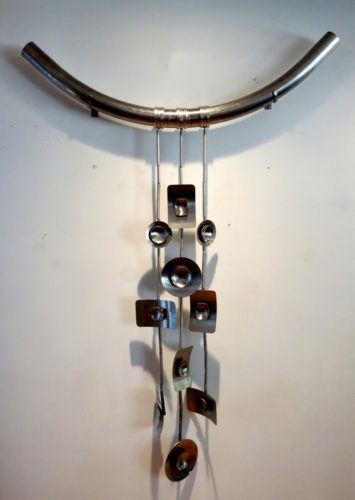 In Love with an Idea’ is the signature mixed media piece in Susan Hickman’s ‘The Golden Hour’ exhibition on view in the ESB Gallery at the Sculpture Grounds during Summer Sculpture Showcase 2017. 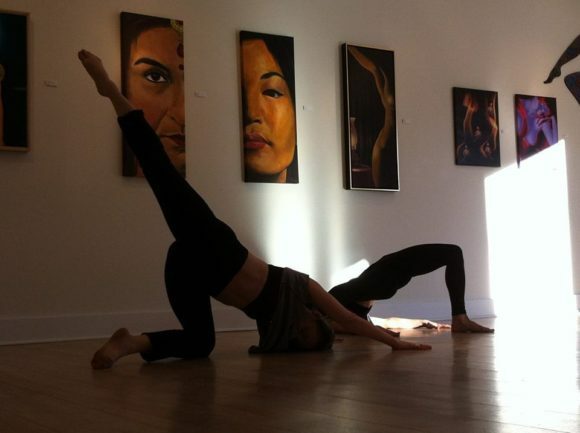 A second exhibition will be on view in the ESB Gallery located on the Studio 80 grounds during the Showcase. “The Golden Hour” will feature mixed media works by talented indoor artist Susan Hickman, who was born a twin in rural Ohio. She grew up in a small town and went on to study graphic design and photography at Ohio University. Hickman moved to New York for a year before making her way up to the New England area where she has spent the last 15 years. She is currently a resident artist of Hygienic Gallery in New London. 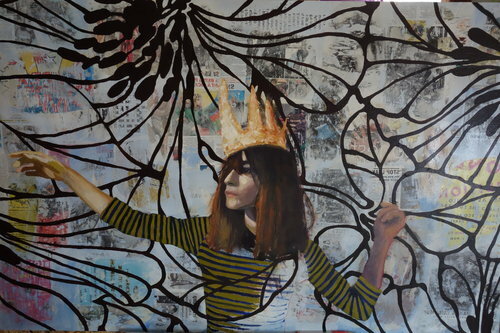 An eclectic mixed media artist working with paper, acrylic, ink, oils, found objects, graphic design, clothing design, photography and more, Hickman has also owned and managed several small galleries in New London including DEW ART Gallery, TAKEOUT Gallery and Down Gallery in Mystic. She utilizes studio waste, discarded paintings, and found textiles as well as new ones, thus creating a restorative process, making something new from the past. She enjoys experimenting with texture and color and finds making art of any kind an exploration and an escape. ‘Amulet’ by Gints Grinbergs is the signature piece of Summer Sculpture Showcase 2017. 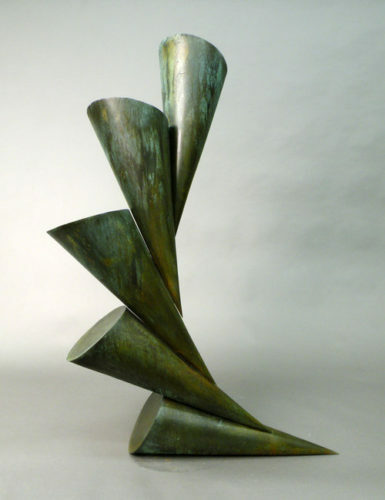 The signature piece of the exhibition is Amulet by Gints Grinbergs, who works with a variety of metals, including copper, bronze, and stainless steel, to create open forms. Welding metal spheres and partial spheres, he creates modern structures, for indoors or out. Fascinated by pictures taken by the Hubble telescope and electron microscopes, Grinbergs makes associations with galaxies and molecular structures. The combination of a modern metal structure with rough, natural stone make these works unique sculptural forms. Grinbergs has a BFA and a BA. in architecture from the Rhode Island School of Design and has studied at Massachusetts College of Art and the School of the Museum of Fine Arts, Boston. His work has been featured at the DeCordova Museum and Sculpture Park; Michael Beauchemin Gallery, Boston; and Lever House Gallery, New York, N.Y. and is Included in private and corporate collections throughout North America. ‘Green Descent’ by Greg Bailey is a featured piece in Summer Sculpture Showcase 2017. Fox by Michael Alfano is a delightful, engaging study in realism. The sculptor explains that he has been, “… sculpting figures, monuments, and philosophical pieces for 20 years,” and comments, “If the artist taps into a universal truth, the piece is felt by everyone like clear mountain air.” He first studied at the Art Students League of New York with an emphasis on life size sculpture and anatomy. His formal education continued at Boston University, and was augmented by internships with several prominent sculptors. He continues his training with master classes, and occasionally teaches sculpture. Alfano exhibits his work at galleries and other public venues, and he is a regular entrant in art shows, where he has garnered over 60 awards. 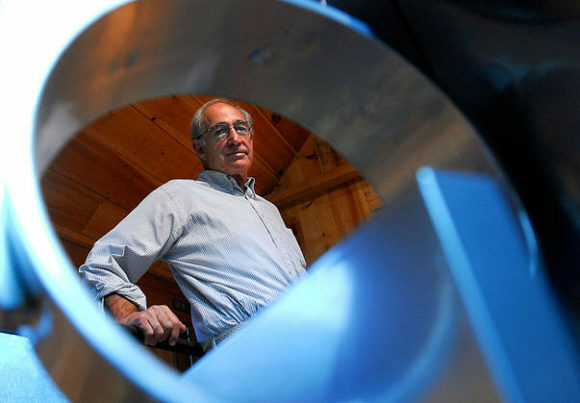 His sculptures are found in private collections throughout the world and can be seen in monuments and other public art on permanent display in the United States. Alfano’s work has been featured in newspapers, magazines, books, and on television. 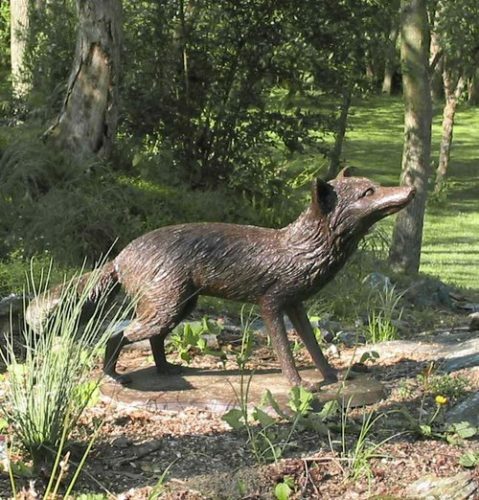 ‘Fox’ by Michael Alfano is a featured piece in Summer Sculpture Showcase 2017. The jurors for the exhibition were sculptor Gilbert V. Boro, art historian Barbara Zabel and photographer Christina Goldberg. Boro has enjoyed an extraordinary and distinguished more than 50-year-career as a successful architect, sought-after international design consultant and an inspiring educator. With a BFA from Duke University and post-graduate degrees from Columbia University, NYC, his work explores the interplay of space, place and scale in a wide range of media including steel, stone, wood, metal, aluminum and fiberglass. Working in sculpture has been a compulsion rather than a possibility for Boro. While mastering the rigors of technical competence, he developed a deep-seated passion for three-dimensional art, which continues to be the influential force behind his creations. He is both inspired and motivated by the creative freedom of sculpting, finding that abstract work is the means to fulfill his vision. 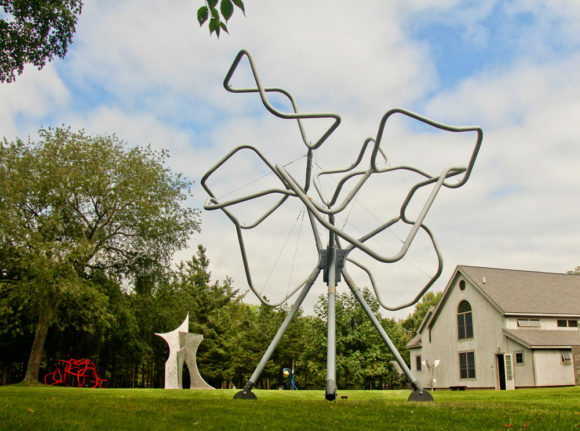 Boro’s sculptures can be found in art centers and public art venues across the US and throughout Europe; they have also been purchased by private collectors, corporations and foundations in both the US and internationally. Sculptor Gilbert V. Boro in his studio. 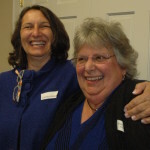 Zabel is Professor Emerita of Art History at Connecticut College, where she taught modern and contemporary art. She received her PhD at the University of Virginia and has received grants from the NEH, the Smithsonian, and the Mellon Foundation. She has written for art magazines and has published two books, the latest Calder’s Portraits, published in 2011 by the Smithsonian for the exhibition she curated at the National Portrait Gallery. Since her retirement, Professor Zabel has taught several courses at local museums and has organized several exhibitions for the Lyman Allyn Art Museum, most recently The David Smalley Memorial Exhibition, which opens June 3 and is on view through Aug. 13. Goldberg has worked as Exhibitions Coordinator and resident photographer for Studio 80 + Sculpture Grounds for almost five years. She is chief curator of Summer Sculpture Showcase 2017 and also photographs all the works exhibited on the sculpture grounds on a revolving basis. Additionally, she builds and designs web content for a great range of social media outlets, both for Studio 80 and external clients. With a background in visual arts and communications from the University of Hartford Art School and Suffolk University, Goldberg’s photographs have been published extensively in numerous local print and digital venues including Coastal Connecticut magazine, Middletown Press, and Events magazine. A selection of her photographs will be on display in the coming months at Paynter Fine Art Gallery, located in the heart of Old Lyme’s Historical District. View across Gil Boro’s Sculpture Grounds looking towards Studio 80. Boro is somewhat unusual as a professional sculptor in that he loves to see folk of all ages directly interacting with his sculptures, noting that he has a strong aversion to exhibitions, “… where people can’t touch my work.” Apart from attracting visitors to see the works on his grounds, Boro is thoroughly invested in the vibrant Old Lyme arts scene and hopes this exhibition will help cement the town as a summer destination for art-loving visitors from near and far, especially during the town’s Midsummer Festival, which this year is on Friday, July 28, and Saturday, July 29. The ‘Onrust’ docked at Saybrook Point Inn and Spa. 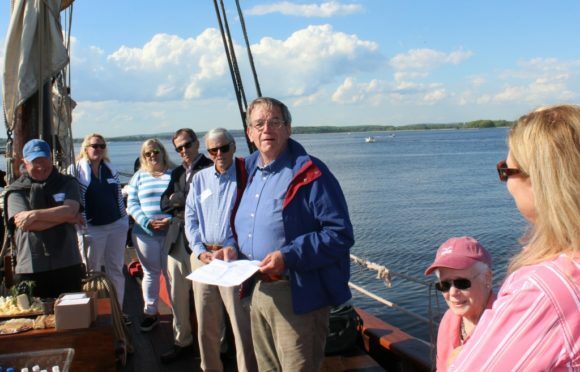 ESSEX — It was “a momentous occasion,” according to Connecticut River Museum Executive Director Chris Dobbs when a group of dignitaries and invited guests gathered to board the re-creation of Adriaen Block’s boat Onrust last Thursday (June 1.) Dobbs pointed out that it was, “400 years ago — 403 to be precise” since the original Onrust commenced its exploration of the Connecticut River ultimately exploring it upstream to just a little further north than present-day Hartford — a distance of approximately 60 miles from Long Island Sound. 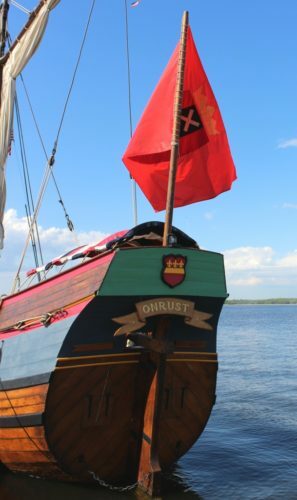 The re-created Onrust was launched in 2009 by The Onrust Project, an all-volunteer non-profit out of New York, which built the vessel after painstakingly researching traditional Dutch shipbuilding techniques. To reach the Saybrook Point Inn at Old Saybrook, Conn., where the guests boarded the ship, the Onrust followed a similar path to the one that Block took in 1614. 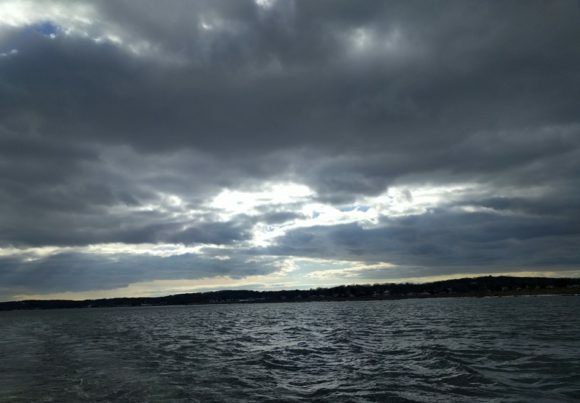 It departed from Kingston, N.Y., traveled to New York Bay, traversed the treacherous Hell Gate, entered Long Island Sound and sailed to the mouth of the Connecticut River. 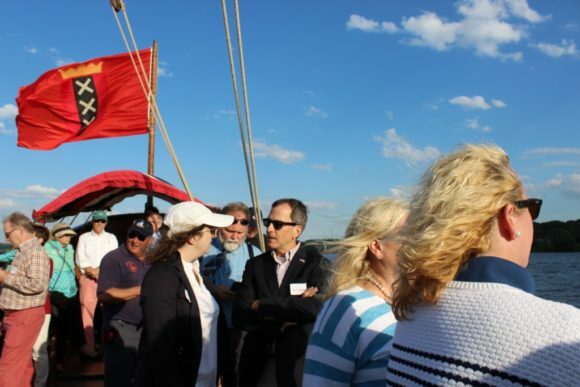 While preparations were made to launch, Connecticut River Museum Board Chairman Tom Wilcox told the guests now assembled on board the Onrust, “This is a most auspicious occasion,” and correctly predicted they would have, “a lovely sail.” Despite an earlier threat of rain, the weather cooperated completely with warm temperatures and clear skies. Another guest on board was Steven Tagliatella, owner of the Saybrook Point Inn, who spoke effusively about the upcoming trip to the Connecticut River Museum describing the Onrust as “a spectacular sight.” He also took the opportunity to mention the new tourism coalition he has formed to promote tourism in the state, noting that the Onrust offers “a wonderful opportunity” for tourism. 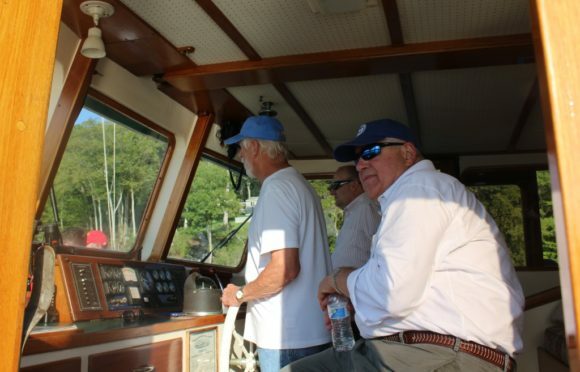 Old Saybrook First Selectman Carl Fortuna (center in sunglasses) chats with a guest during the trip up the Connecticut River. Jennifer White-Dobbs enjoys the glorious river views with her son (right) and a guest. The Essex Sailing Masters of 1812 greeted the ‘Onrust’ with bright melodies in front of the Museum. Before introducing the next speaker, Dobbs noted, “The amount of research to build this vessel was amazing,” and also that it had taken, “Around 250 people to build the Onrust.” He explained that the Onrust will be a floating exhibit at the Museum through early October, open for dockside tours, school and Scout programs, along with public cruises and charters. 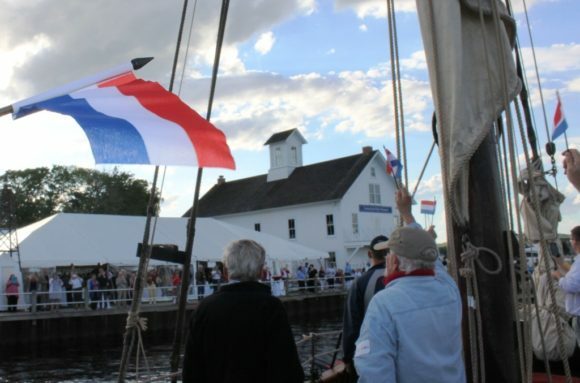 The guests vigorously waved Dutch flags as the ‘Onrust’ pulled into the Connecticut River Museum’s dock. 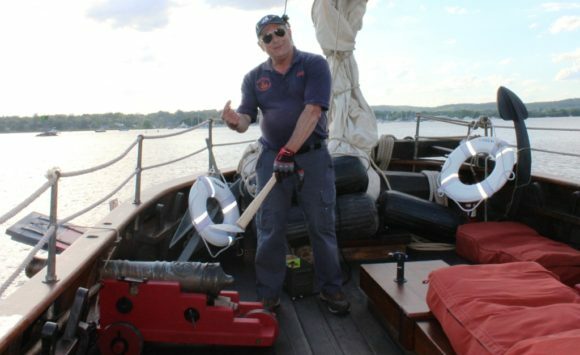 A crew member prepares to fire the cannon to announce the boat’s arrival at the Connecticut River Museum. 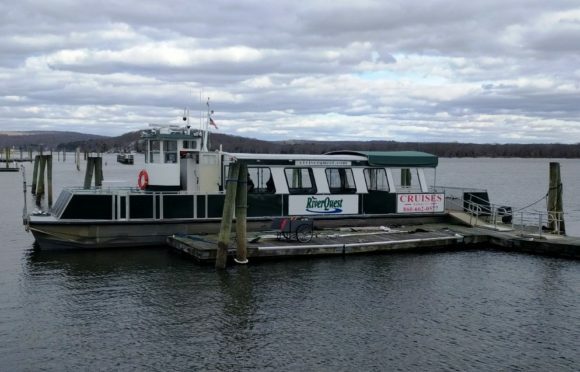 Finally the Onrust departed from Saybrook Point inn and sailed serenely up the Connecticut River offering spectacular views in all directions. 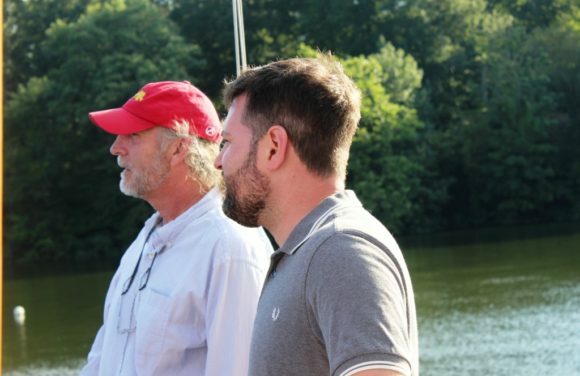 As the three-man crew prepared for arrival at the Museum during the first hour of the popular RiverFare event, one crew member fired a celebratory cannon. Meanwhile, Essex’s very own Sailing Masters of 1812 provided a cheery, musical fanfare as the historic vessel approached the Museum’s dock. It was indeed a wonderful and “momentous” trip! For more information on the Connecticut River Museum and the Onrust, visit the Museum’s website. 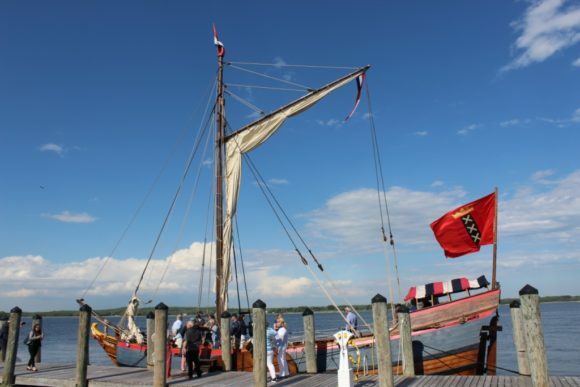 The Museum extends special thanks to Saybrook Point Inn, Marina & Spa, Essex Meadows, the Sailing Masters of 1812, and The Onrust Project for their efforts in arranging the vessel’s arrival. 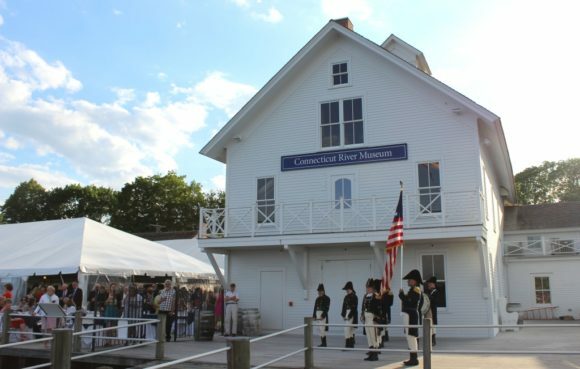 The Connecticut River Museum is located on the Essex waterfront at 67 Main Street in Essex and is open daily from 10 a.m. to 5 p.m. 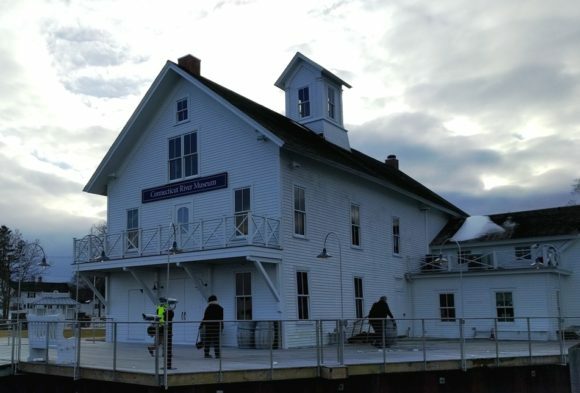 The Museum, located in the historic Steamboat Dock building, offers exhibits and programs about the history and environment of the Connecticut River. 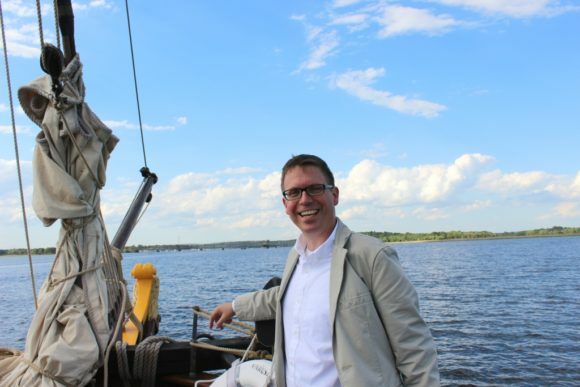 For a full listing of Museum programs or to buy tickets for the Onrust, RiverFare, and many other events go to www.ctrivermuseum.org or call 860-767-8269. 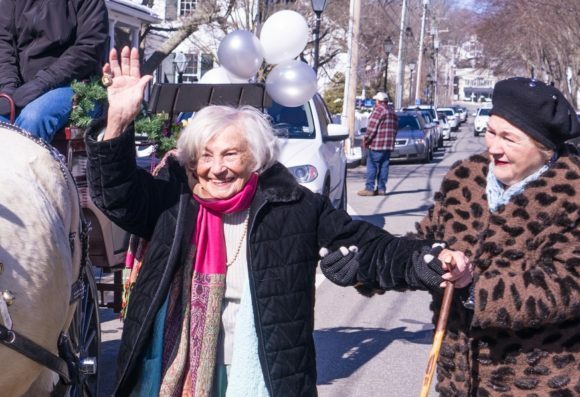 Happy 99th birthday, Mary ! 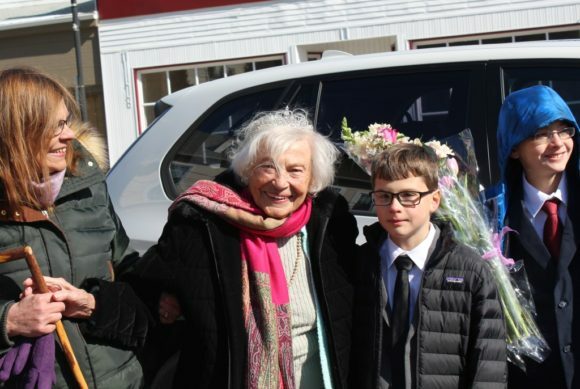 It may have been one of the coldest days of the year last Sunday, March 12, but nothing was going to stop Mary Vidbergs’ family from celebrating the long-time Essex resident’s 99th birthday in style. 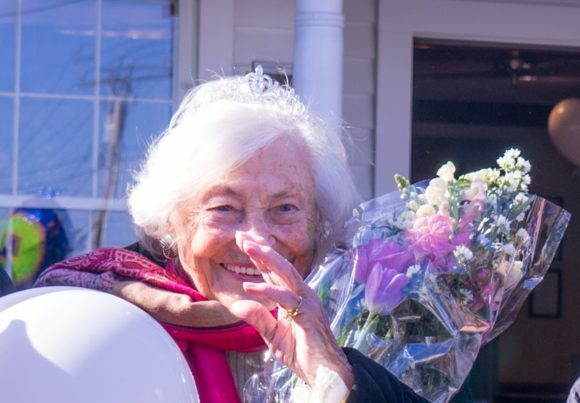 Mary arrived around 11 a.m. at the top of Main Street and was promptly presented with a large bouquet and ‘crowned’ with a tiara. 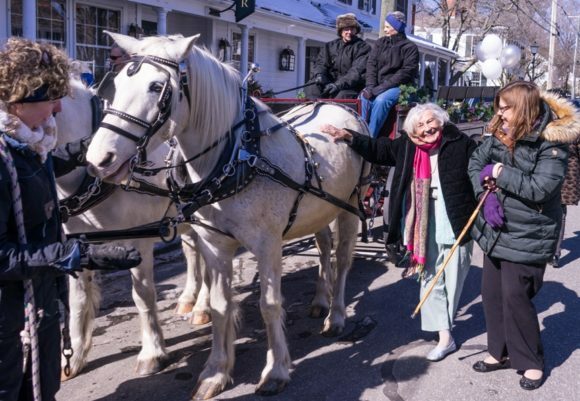 The family — some of whom braved the bone-chilling temperatures in lederhosen — had planned a surprise for Mary, which involved driving her from the top of Main Street in a horse-drawn carriage down to the Griswold Inn. 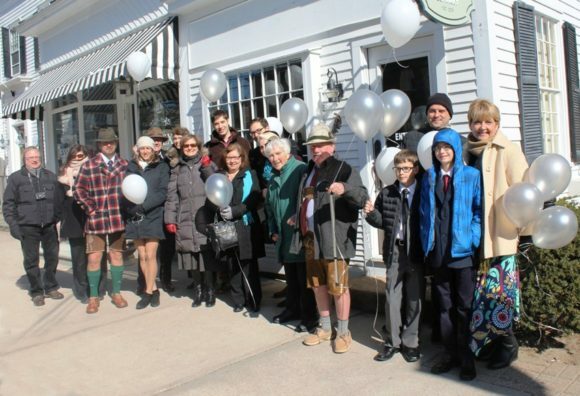 Dr. John Pfeiffer of Old Lyme (third from right, front row, in the photo above), who is Mary’s son-in-law as well as Old Lyme’s Town Historian, is well-known for his penchant for wearing shorts in all weathers around town! 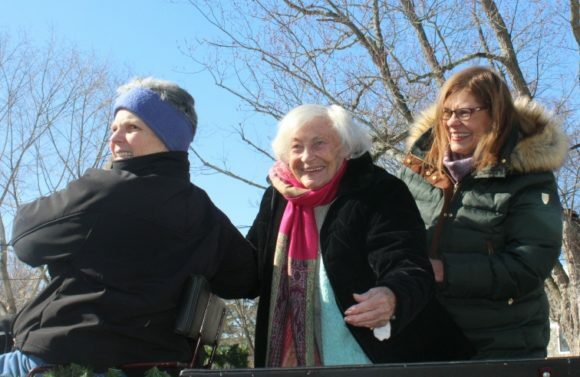 She may be 99, but Mary was determined to enjoy the view from her carriage! Despite the sub-zero temperatures, Mary smiled continuously through the whole adventure and insisted at the end of her ride on thanking the horses for their labors. An ever-cheerful Mary waved goodbye to the crowd before entering the Griswold Inn where all her family joined her for what we’re sure was a wonderful family party. Happy 99th, Mary, from all your friends at ValleyNewsNow.com — we’re looking forward to your 100th already! 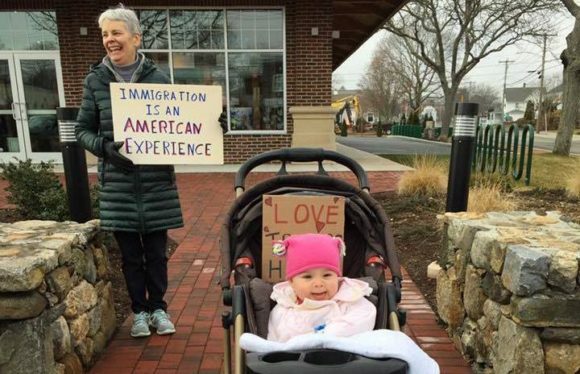 Baby’s first march — we suspect not Grandma’s! 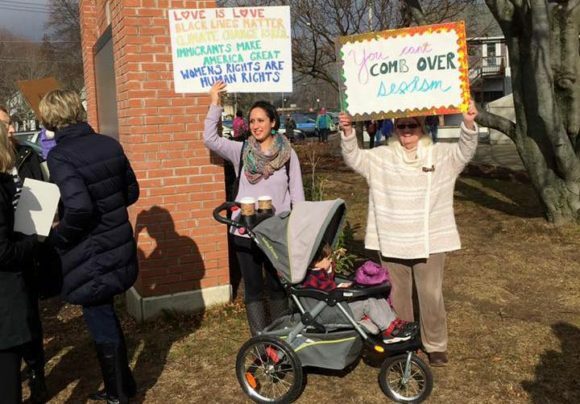 AREAWIDE — The march may only have been registered late last week, but almost 1,000 people still turned out Saturday morning in Old Saybrook to join the movement that inspired around three million people across the globe to publicly express their opinions on the rights of women and other minority groups, and in many ways on the new Trump presidency as a whole. 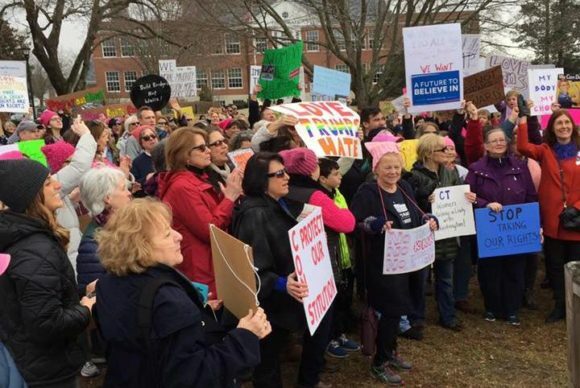 More than 500 people had gathered by 10 a.m. on the Old Saybrook Town Green unsure whether they were just going to simply stand in front of the Town Hall or whether they were actually going to march. 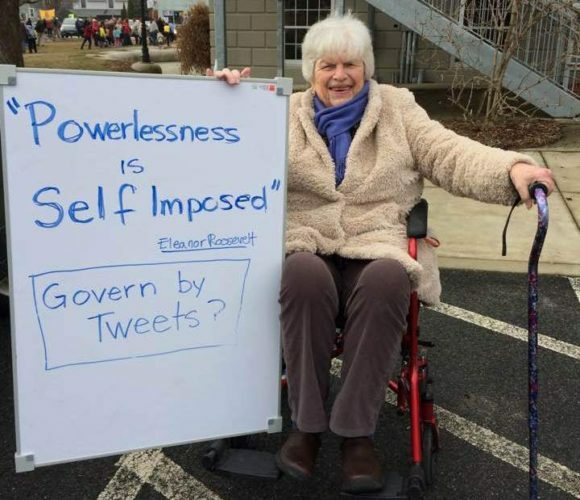 Others like Alison Mitchell of Old Lyme fearlessly sat in her wheelchair strongly and stoically making her point. 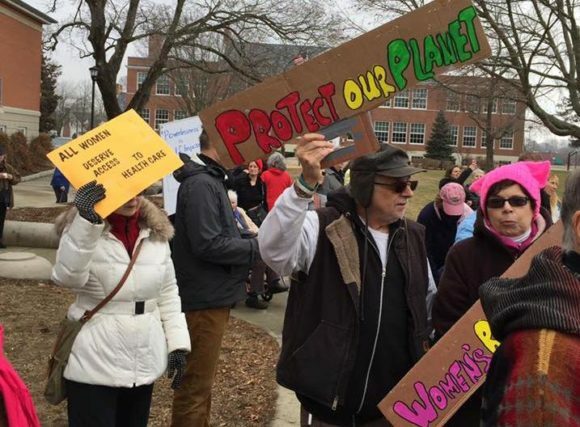 Around 10:30 a.m., it became apparent that a march was beginning going north up Main St. on the east side towards Boston Post Rd. then crossing over and returning to the Green going south on the west side. 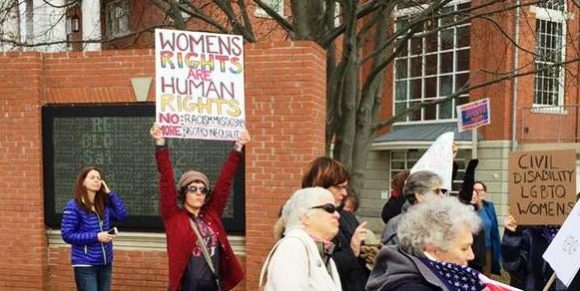 By this time the crowd had swelled by several hundred more and as the demonstrators marched, more and more people joined. From left to right, some Old Lyme marchers share a smile. But once wasn’t enough for these intrepid marchers. Almost as soon as they found themselves back at ‘The Kate,’ they started re-tracing their steps and ultimately completed a second loop. 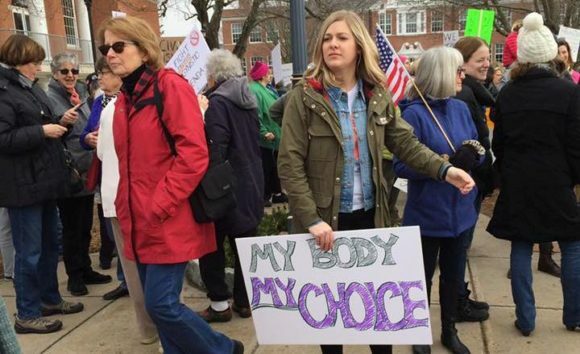 The Old Saybrook Police did a wonderful job stopping the patient traffic so that the marchers could cross Main Street whenever necessary. By the time of the second circuit, the line of marchers was so long that it snaked down one side of Main St., across the road and then up the other side. 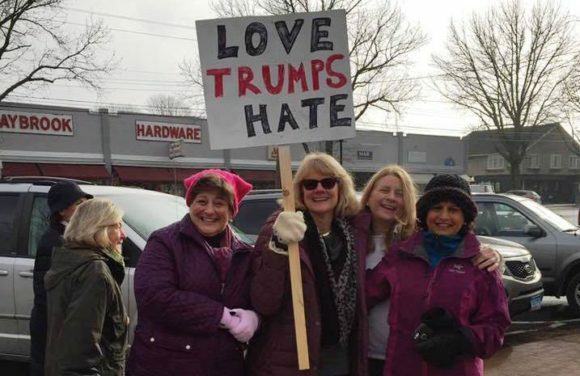 Passengers were getting out of cars to join the march, horns were being sounded regularly — and loudly — in support of the marchers and only one lone pick-up truck with “Trump’ flags was spotted. 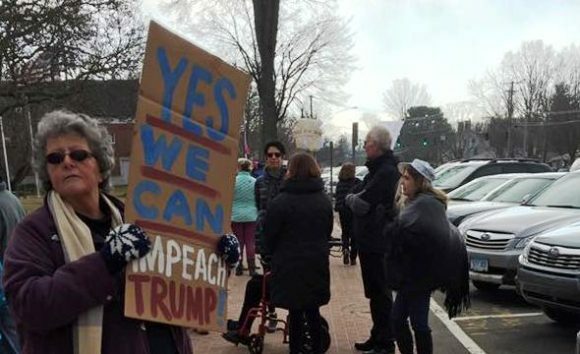 At the end of it all, the marchers happily gathered in front of the Town Hall and in communion with all the other marchers across the nation and the world, observed a meaningful moment of silence before peacefully dispersing. Essex First Selectman Norm Needleman (left) and Sen. Art Linares answered questions on a variety of topics in last night’s debate. 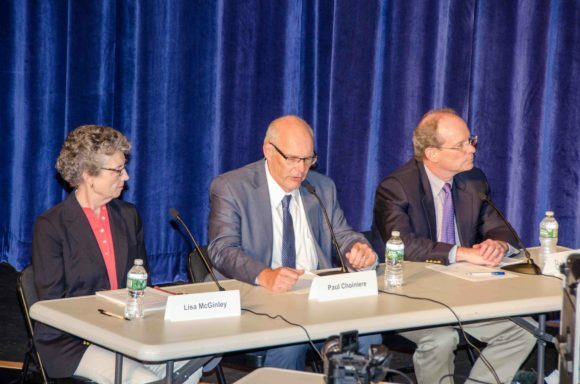 OLD LYME — The candidates vying for the 33rd State Senate District seat met Thursday night in front of a relatively small audience of around 75 in the somewhat rarefied atmosphere of Lyme-Old Lyme High School (LOLHS). 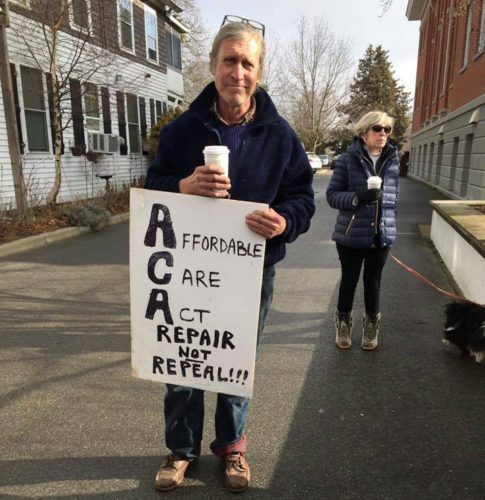 Rarefied because not a single resident of Old Lyme can vote for either candidate since Old Lyme is part of the 20th State Senate District currently represented by Republican Paul Formica. 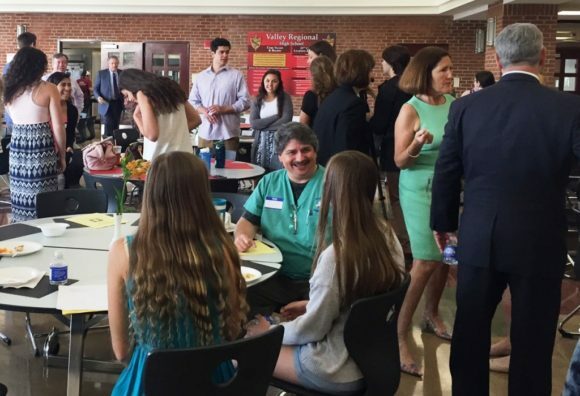 Nevertheless, The Day and the Eastern CT Chamber of Commerce selected LOLHS as the location for the first debate of the season in the high profile 33rd State Senate race. 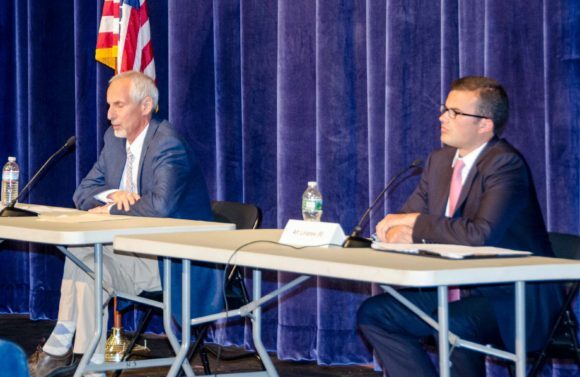 Two-term incumbent Sen. Art Linares (R) faced off against challenger Norman Needleman (D), who is in his third term as first selectman of Essex, in a gentlemanly debate conducted entirely from seated positions. The Day’s Editorial Page editor Paul Choiniere (center in photo above) moderated the debate assisted by retired Day Deputy Managing Editor Lisa McGinley and Day Staff Writer Brian Hallenback. The constant theme of both candidates’ responses was the need for the state to control spending and to increase jobs, but they expressed different routes towards achieving that goal interspersed with regular jabs against their respective opponent. Needleman, pictured above, then accused Linares of being something Needleman confessed he had been described as himself when much younger by a teacher, namely, “A master of the obvious.” Needleman agreed, “We all know now we need structural reform,” but argued, “That stand needed to be taken,” long before the actual vote. 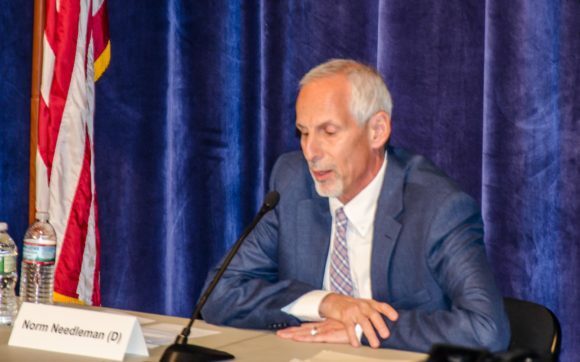 The candidates responded to several further questions including ones about the ease with which the state can sell or swap state-owned land, how the state should create jobs and the state’s response to the opioid crisis. 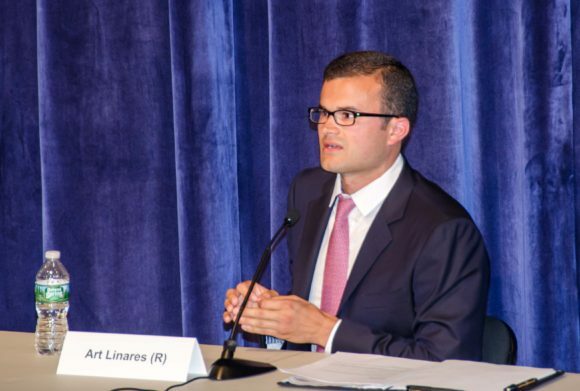 In his closing statement, Linares said his goal was, “to take Connecticut to the top again,” since under six year of Malloy’s leadership, “”I have seen the state move backwards.” He explained that Connecticut Republicans have a plan to achieve that objective called, “A Confident Future,” and urged the audience to review it. 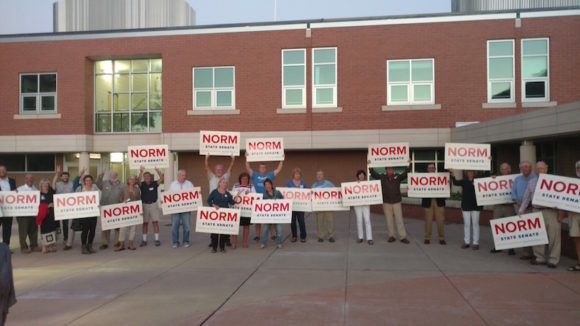 Prior to the debate, Needleman supporters were out in force in front of Lyme-Old Lyme High School. 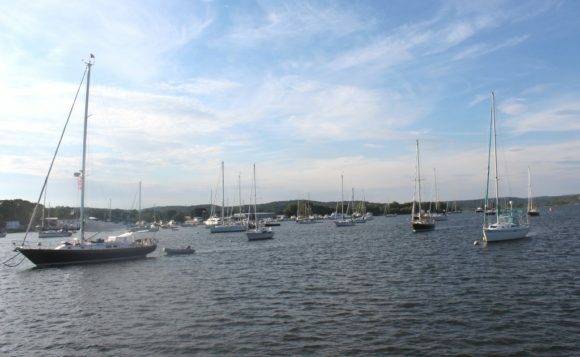 Editor’s Note: The 33rd State Senate District consists of the Town of Lyme along with the Towns of Chester, Clinton, Colchester, Deep River, East Haddam, East Hampton, Essex, Haddam, Portland, Westbrook, and part of Old Saybrook. 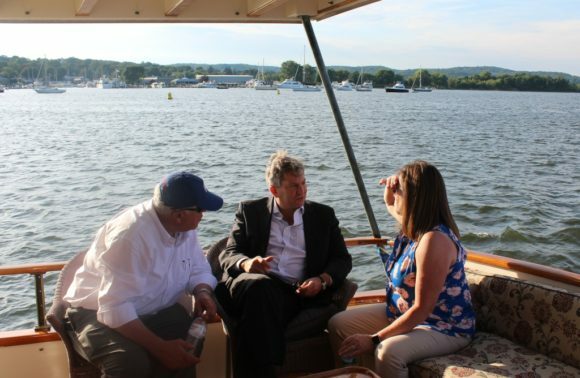 Enjoying a boat ride on the Connecticut River, but still finding time for discussions, are (from left to right) Chester First Selectwoman Lauren Gister, Old Lyme First Selectwoman and Connecticut Port Authority (CPA) board member Bonnie Reemsnyder, Essex First Selectman Norm Needleman, CPA Chairman Scott Bates and Deep River First Selectman Angus McDonald, Jr.
Scott Bates, CPA Chairman, receives input regarding the town’s needs from Norm Needleman, Essex First Selectman. 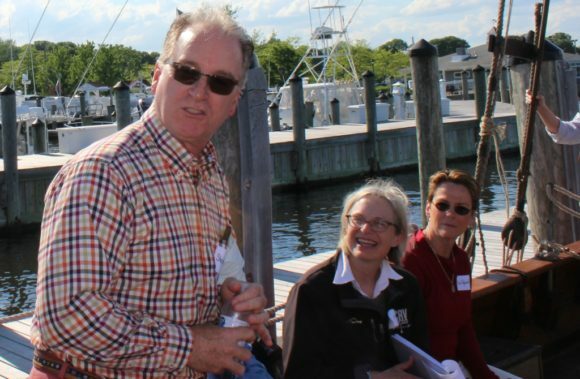 Bates noted that to have “five local officials (Chester First Selectwoman Lauren Gister, Deep River First Selectman Angus McDonald Jr., Essex First Selectman Norm Needleman and Old Lyme First Selectwoman Bonnie Reemsnyder, all of whom were on board, and Old Saybrook First Selectman Carl Fortuna, who was unable to join the trip) “involved” was a really positive sign in terms of “building a coalition.” This, Bates explained, was key to the development of a strategic plan for the CPA—something the Authority has been charged with preparing with a deadline of Jan. 1, 2017. 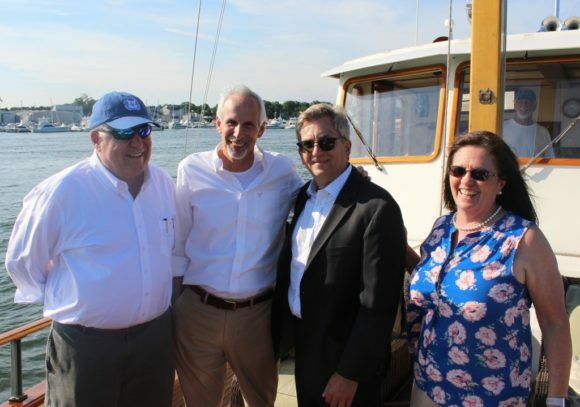 Gathered for a photo are (from left to right) CPA board member John Johnson, Essex First Selectman Norm Needleman, CPA Chairman Scott Bates and Old Lyme First Selectwoman and CPA board member Bonnie Reemsnyder. 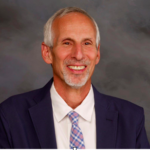 Apart from Bates and the four local First Selectmen and Selectwomen, also on board were Lower Connecticut River Valley Council of Governments (RiverCOG) Executive Director Sam Gold, River COG Deputy Director and Principal Planner J.H. Torrance Downes, CPA Board of Directors member John Johnson and Joe Salvatore from the CPA. Reemsnyder is also a board member of the CPA. 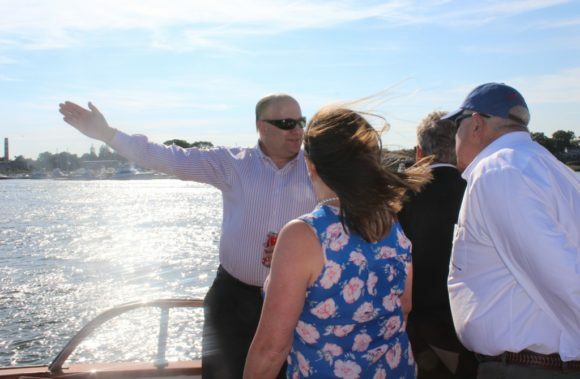 Connecticut Port Authority staff member Joe Salvatore points out a river feature to Reemsnyder, Bates and Johnson. 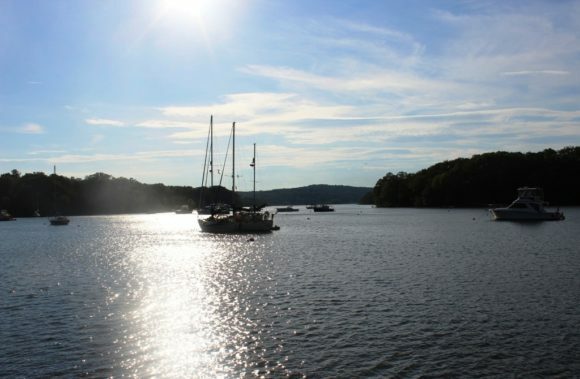 At the earlier meeting in Old Lyme, Downes had given a presentation to CPA members to introduce them to the Lower Connecticut River during which he had described the geography of the estuary, noting it had, “very little industry and very little commercial development.” He described it as a “really prime area for bird migration” and highlighted numerous points of scenic beauty. J.H. 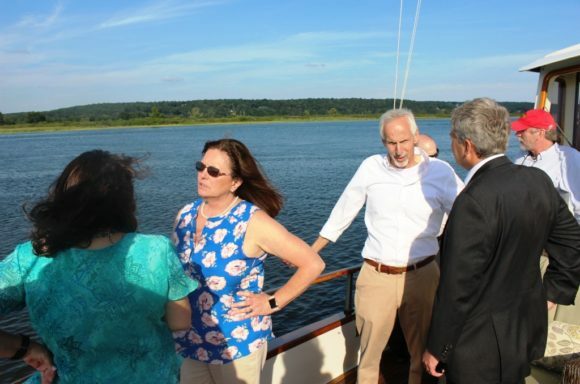 Torrance Downes, Deputy Director of River COG, takes in the view of the Connecticut River. John Johnson, CPA board member (right) checks in with the captain of the ‘Victoria.’ Joe Salvatore stands at rear. John Johnson (left) and Bonnie Reemsnyder (right), both CPA board members, chat with the CPA Chairman Scott bates. The quiet, untouched beauty of Hamburg Cove. 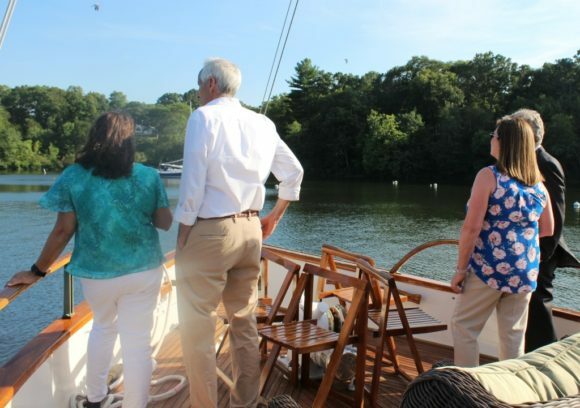 Eyes on the Cove — guests on the ‘Victoria’ gaze at the view across the calm waters of Hamburg Cove. The 10th Annual Partnership Celebration brought interns and their mentors together for food and farewells. 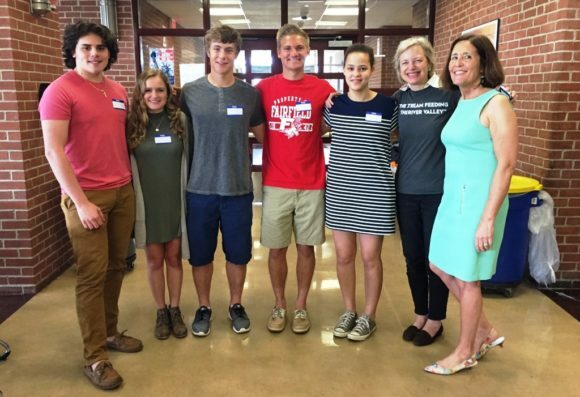 AREAWIDE — Ten years ago Valley Regional High School (VRHS) School-to-Career Consultant Mary Hambor started a program for students at the school interested in finding out more about jobs in the real world with five internships. On May 26 this year, at the 10th Annual Partnership Celebration, she described how during the 2015-16 academic year, she had placed 95 seniors and seven juniors in a total of 102 internships. 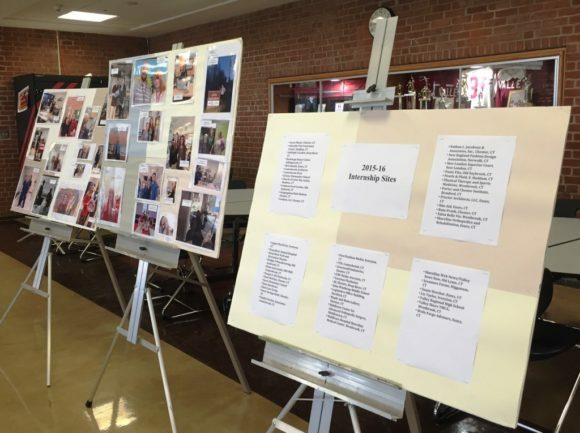 Poster boards listed all the businesses and organizations which had taken interns during the 2015-16 academic year. Dr. Dave Scruggs of Deep River Animal Hospital stands with Mary Hambor, VRHS School-to-Career Cordinator. Mary Hambor (right) stands with Ibby Carothers of iCRV Radio and the students who interned at the radio station. Hannah Halsey spoke about the experience that she and several of her peers had enjoyed interning at iCRV Radio in Chester and then Ivoryton. She said it was, “a really great learning experience during which she and her friends had “learned about marketing” and acquired many new skills, such as “how to operate a database.” The interns had actually hosted a radio show at one point! 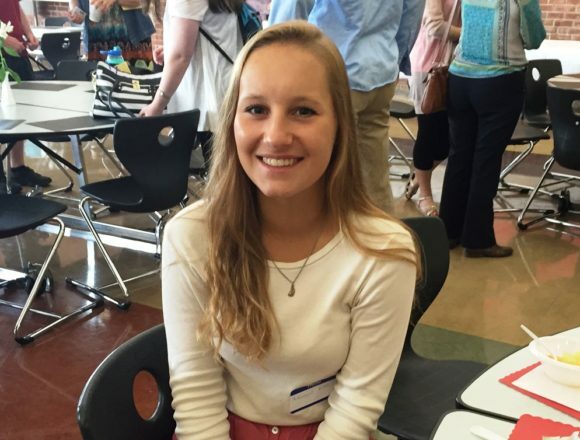 Our very own ValleyNewsNow.com wonderful intern, Maggie Klin! Several of the mentors took the opportunity to say publicly how the internship had gone from their angle. Rebecca Foley from IRIS said, “Anastasia did an incredible job” and noted that she had gone far beyond the call of her internship and raised $827 for the organization in her own time. A large crowd gathered at Studio 80 + Sculpture Grounds in Old Lyme to hear the latest on the proposed high speed railroad track. 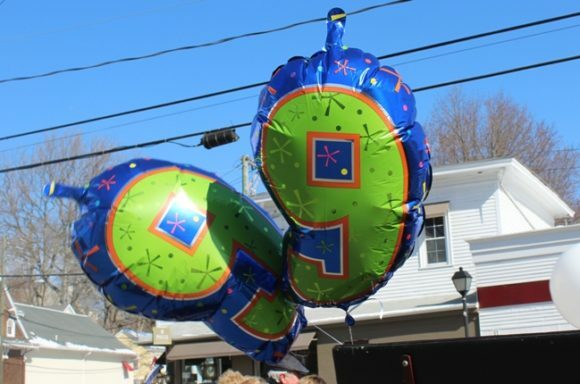 More than 80 people gathered in Gil Boro’s Studio 80 on Lyme Street in Old Lyme Sunday afternoon to hear a variety of speakers give updates on the latest developments in the saga involving the Federal Rail Authority’s (FRA) NEC Future’s proposals for an upgraded high speed railroad track from Washington DC to Boston. The event had a lighter side with musical performances from Ramblin’ Dan Stevens, Clayton Allen and friends, and the Localmotives with Eleanor Robinson, the Shrivers and friends. But the main thrust of the program was to educate and inform the attendees about the status of FRA’s plans … and what to do about them. Greg Stroud makes a point during his presentation in Studio 80 + Sculpture Grounds. State Senator Paul Formica (R- 20th, center) and State Representative Devin Carney (R-23rd, right) listen carefully to an attendee’s point. Pre-addressed postcards were available at the event for attendees to write a personal note to Senator Blumenthal, who Stroud noted is “the most active supporter of high-speed rail in Congress” and the ranking member of the Senate committee in charge of the rail planning process. 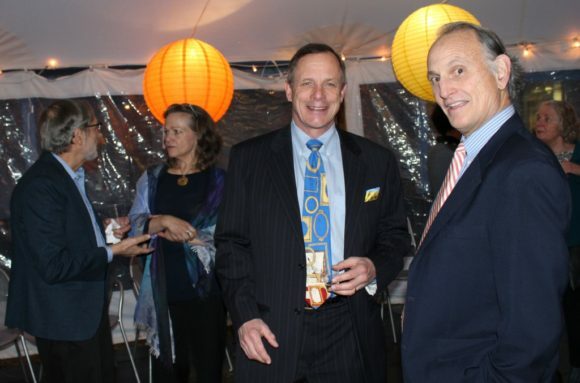 Stroud said Blumenthal could therefore be enormously influential in the final route decision. BJ Bernblum reads Old Lyme First Selectwoman Bonnie Reemsnyder’s statement to the audience. Daniel Mackay, Executive Director of the CT Trust for Historic Preservation, discusses a point after his presentation. Greg Stroud addresses the audience from the mezzanine level where the musicians played during Sunday’s event. Mackay said the Trust will be “picking up costs” associated with the project and donations to the group can now be accepted. He said information on how to donate to support the project is on the SECoast website and 100 percent of any donation will go to the project and is tax-deductible. 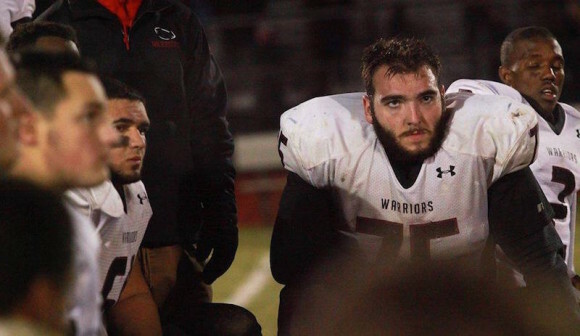 Lyme-Old Lyme High School senior Jack Giaconia, who was a starter on the Valley Regional/Lyme-Old Lyme ‘Warriors’ co-op football team throughout his high school career, has signed a Letter of Intent to be a preferred walk-on with the UConn Huskies. Congratulations, Jack — we’ll be following your career with great interest! 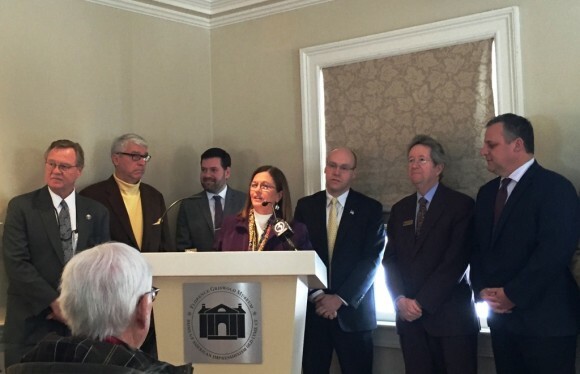 Old Lyme First Selectwoman Bonnie Reemsnyder stands at the podium at Wednesday’s press conference at the Florence Griswold Museum. State officials and some of the signatories of a letter to the FRA denouncing Alternative 1 stand around her. The ‘menace’ in this case is Alternative 1 of the three high-speed railtrack routes proposed by the Federal Railroad Authority (FRA) in their Northeast Corridor (NEC) Future plan. But let’s backtrack for a second — why is the FRA proposing these new routes? Their objective is, “to improve the reliability, capacity, connectivity, performance, and resiliency of future passenger rail service … while promoting environmental sustainability and continued economic growth.” Let’s say right away that we are fully supportive of this objective — we are huge fans of rail-travel — you cannot grow up in Europe without taking rail travel for granted. The trains there are fast, clean and efficient … they are a way of life. We absolutely wish it were the same in the US. So what is the difference here? Why has the reaction to Alternative 1 been so strong, so united, so passionate? In case you are unaware, Alternative 1 calls for the high speed rail track to cross the Connecticut River over a new bridge a little higher up the river than at present and then travel to the center of Old Lyme bisecting Lyme Street by eliminating both the western and eastern campuses of Lyme Academy College of Fine Arts before turning north and crossing I-95. The 1817 John Sill House, currently owned by the Academy and situated on its campus, would likely be acquired by the FRA by eminent domain and then demolished. The impact of a high-speed railtrack through that sector of town would be totally devastating for our community, effectively destroying its very heart. This editorial could now run for pages to explain the full spectrum of impact to Old Lyme of this proposal. We could talk about the untold damage to the storied structures on Lyme Street and list the irreplaceable buildings that will either be completely destroyed or permanently scarred by this new train track construction, many of which are either National Historic Landmarks or on the National Historic Register. 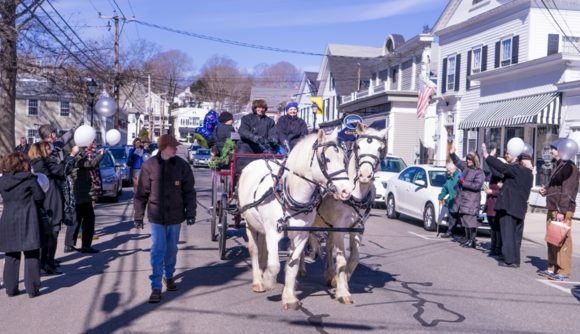 We could mention that Lyme Street is the joyful, bustling hub of our little town — it has a unique personality and touches every aspect of our community life. 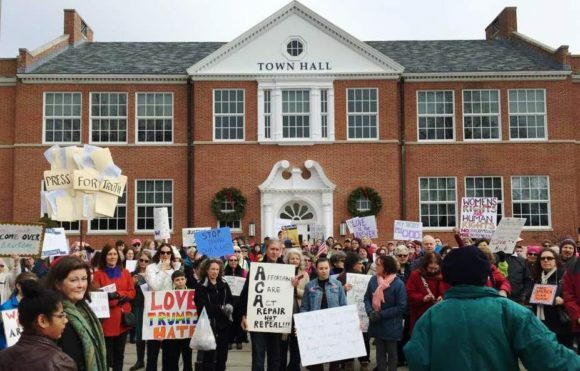 It is home to our town hall, our public schools, our daycare, our youth services, our library, our churches, our village shops, our art college, our art association (the oldest in the country), and the Florence Griswold Museum (a national institution.) Can you even begin to imagine Lyme Street with a high speed railroad running across it? And let’s just consider for a minute what this proposal, if implemented, would achieve? Bearing in mind that you can already travel from London to Paris (286 miles) in 2 hours and 15 minutes, would we be able to hop on a train in Old Saybrook and be in Washington DC (334 miles) roughly two hours and 45 minutes later? No, the current travel time of six hours would be reduced by a grand total of 30 minutes to 5 hours and 30 minutes. Unbelievable. As we said, we could go on for pages but others have kindly taken care of that for us. There was a splendid press conference yesterday, which spelled out the craziness of Alternative 1 from every angle — coldly, clinically and objectively. The Old Lyme-Phoebe Griffin Noyes Library has a full print copy of the NEC Future tome if you care to read it in its entirety. 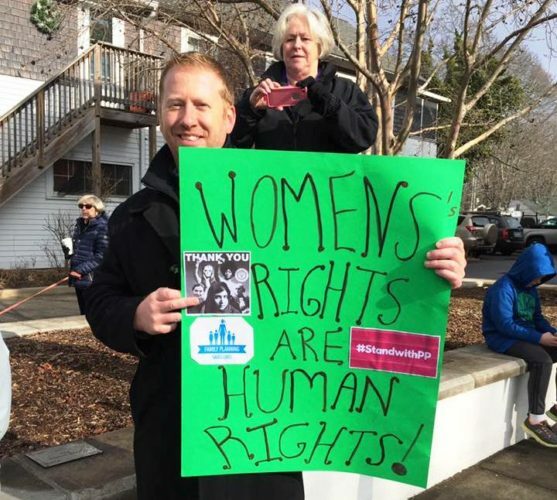 There are links galore on the Old Lyme Town website to the statement and attachments submitted yesterday (Feb. 10) on behalf of some 20 local organizations to the FRA. The comment period was originally only until Jan. 31, but there was such a huge outcry as the reality of Alternative 1 began to be fully understood that it has been extended to next Tuesday, Feb. 16. The FRA needs to hear from each and every one of us — you don’t need to write an essay, you don’t need to write eloquently, in fact, you don’t really need to write much at all, but you do need to write — today or tomorrow, even the next day, but if you have anything to say about Alternative 1 and want your voice to be heard, you absolutely must write. We sincerely hope that there will soon be a public forum of some sort where people can ask questions and comment in person but, in the meantime, we say again, PLEASE, PLEASE WRITE TO THE FRA!